Our neighbourhood has older trees, some of which will die in the next few years. As you walk around you can easily identify some of these trees and there are a few that have already been cut down or just have a tall stump remaining. (We learned on one of our Jane’s Walks that a tree with two pink dots means it has been identified as being ready to be cut down). Some cities have turned this fact of nature into a positive element by having artists carve the trees into innovative sculptures. 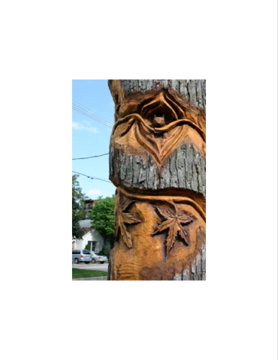 For example, London ON has a great website listing all their carved trees and Orangeville is famous for their carved trees as well. A few people in our neighbourhood think it would be great if we could have a similar set of carvings. It doesn’t have to be city wide (but it could be) and there are artists willing to donate their time so it doesn’t need to cost very much either. The City of Kitchener has been approached in the past about this concept (regarding trees that were on boulevards) and they informed us that decay of the roots made tree trunks unstable. They considered it a liability and were unwilling to be involved in any tree trunk art project. It is possible that we might have more success with trees that are on private property. The MHBP Neighbourhood Mobilization Alliance meets every other month to discuss many issues in our area (By-Law enforcement, policing issues, community gardens etc.). The next meeting is Wednesday, May 18 (7 pm, City Hall) and is on the BLOG calendar. Tree Carving is one of the issues on the agenda so if you are interested in this idea, or anything else that happens in our neighbourhood, please come out to the meeting and talk with your neighbours.